Handwritten Declaration Format of IBPS RRB is a handwritten statement by the Applicant stating that the information that the candidate has provided is true which is signed and stays as a proof of evidence. For the year 2018, IBPS RRB has announced a method of submitting applicant’s handwritten declaration statement while filling up the form. The Institute of Banking Personnel Selection has introduced a new step in filling up the procedure of the IBPS RRB Recruitment Application Form, which is the Handwritten Declaration. Most of the candidates who are willing to fill IBPS RRB 2018 are confused with this new handwriting format. Candidates are searching mentioning- IBPS RRB Declaration, Handwritten Declaration Format etc. So, guys, we have written this article explaining all the details regarding the Handwritten Declaration Format of IBPS RRB. The format of the Handwriting e declaration as published by the IBPS RRB for the 2018 Exam. You need to tell that all information you are providing is correct. 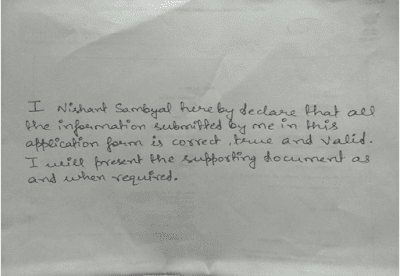 The above-mentioned handwritten declaration has to be in the candidate’s handwriting only. If it is written or uploaded by somebody else or in other languages then the application is considered to be invalid. Applicant must use recent passport size photograph. The passport photo must be colored with a white background. The Photograph must be in JPG, JPEG Format. Applicant must sign on white paper with a black ink pen. If the signature of the applicant does not match at the time of the Examination, the candidate will be disqualified. In a plain white sheet paper (A4), you have to write a declaration in your own writing using a black pen. Scan the page/ or click an image of the declaration of your phone and upload it. Make sure that the image size must be in between 20 Kb to 50 Kb. The Declaration Letter must be in English only. 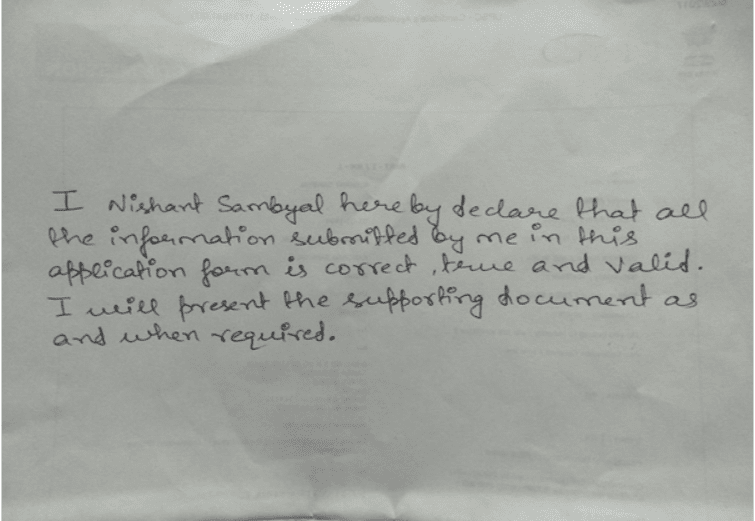 Signature/ Handwritten Declaration in CAPITAL Letters will not be accepted.